Playing roulette at any of the world's casinos demands a set of protocols. This set of unwritten rules has been passed from one generation to the other in order to establish a certain standard. Having exact knowledge about the etiquette is as important as obeying traffic rules and avoid roulette cheating. Any action from your part that undermines (voluntarily or not) the inner policy of the casino, may lead to misinterpretation and the consequences can be bitterly ugly. Being regarded as a cheater is really the last thing one needs, hence learning a simple set of rules is mandatory! The days when the flock of gamblers managed to wash their reputation clean, founding their argumentation on the lack of written data, is over! Here are the most important guidelines and roulette facts that one should follow, especially if he is a newcomer to the industry. Speaking of which, rookies should equally apply these standards in both land based and online casinos. 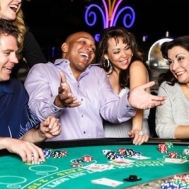 Refrain from making further bets after having heard the dealer saying NO MORE BETS. It would be also wise to leave the chips untouched till the next spin. Gathering your winnings with both of your arms, or with any of your fingers before the dealer paid all of the players is considered to be as rude as handing a banknote to a beggar and taking the change. Only few players manage to get away clean, the ones who don't will have this rule imprinted in their memories for a lifetime. What about the marker? Touching the marker after the roulette wheel has stopped spinning is once again something that should be avoided. Remember not to touch chips until the marker hasn't been cleared. Players are free to touch their chips after the marker has been unlocked. Being aware of your betting rights is of utmost importance! Take call bets for example: it is not an everyday occurrence that call bets are accepted, therefore you should consider yourself honored when this happens. Dealers have a lot of procedures that are indispensable for a clean game, performing all of them is not always possible. When this happens, your Roulette Table Etiquette should work as a life buoy, preventing you from drowning into embarrassment. Skilled players know when their bets are valid or not. Tipping the dealer can also show great signs of respect. The greatest achievement of a player is however the tip, despite losing on several rounds. Do we Need Roulette Etiquette while Playing Online? The virtual platform is the only realm where players can afford to be illiterate in terms of roulette etiquette. The downside is that playing in front of your computer has nothing to do with the real feeling. Those who want to surpass this hypostasis had better be prepared with the above guidelines!